Touched by a Saint: Missionary of Charity Sister Milada met Mother Teresa only three months before her death in 1997. It was the first time she met the former superior general despite being in the order for nine years. FEW women had ever been a professed Missionaries of Charity Sister without meeting Mother Teresa. The Czechoslovakian-born sister, who has been living in the Brisbane house since May, was one of the rare few sisters who had never met Mother Teresa while she was superior general of her order. While many sisters were sent to Kolkata during their novitiate, Sr Milada, who met the Missionaries of Charity while living in Alice Springs, studied in Manila. “So I was regarded as someone really exotic because no sister could believe that I had never met Mother,” Sr Milada said. The daughter of two Czech parents, Sr Milada was working in Alice Springs when she saw a group of sisters in blue-and-white saris walk past her window. Her heart nearly leapt out of her chest. She didn’t even know who these sisters were, but seeing their joyful smiles gave her every reason to drop everything and follow them. 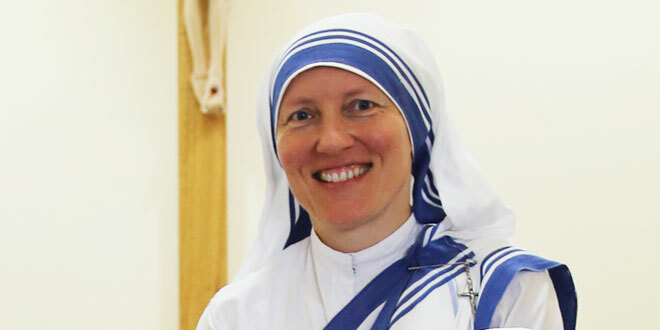 At 20 she joined the Missionaries of Charity in Melbourne, one of the six houses Mother Teresa personally founded. She was in the order for nine years before she decided it was her time to meet her Mother. One year before her final vows, known as a tertianship in the order, Sr Milada plucked up the courage to ask about meeting Mother Teresa in Kolkata. The sisters, pondering why the request had never come sooner, gave their permission, but some were concerned about the delays for visas, which at the time could take up to one year. Miraculously, Sr Milada was granted a visa immediately and in June 1997, she made her first trip to India. Unfortunately, in that same month Mother Teresa had arranged to introduce the then superior general, Sr Nirmala, to Pope John Paul II in Rome, and to fly on to the United States to receive an award. “So when I arrived in India, lo and behold, Mother wasn’t there,” Sr Milada said. It would be another few weeks before Mother would return to Kolkata. The morning after Mother Teresa arrived back at the Mother House in Kolkata, four Missionaries of Charity Sisters overseeing the formation house for the 100 sisters preparing for final vows went to ask for Mother’s blessing. They personally sought out that one sister who had incredibly never met Mother Teresa. It was a hot and humid day in Kolkata. Reaching Mother Teresa’s tiny and almost bare room, situated directly above the convent’s open-fire kitchen, Sr Milada thought of placing a fan above the door to help cool her foundress, who was ill at the time. The sisters walked into the room, asked about the Holy Father and requested a blessing from their Mother. “Mother looked at the door and she saw the fan going, and Mother would not talk to us,” Sr Milada recalled. “She said, ‘Sister, who put it there? Please turn it off, turn it off’ and we pretended we didn’t see, we didn’t hear because we knew we would be in trouble if we did. “We needed her blessing and she would not until it was turned off. “She would not talk to us, she would not give us a blessing, she wouldn’t do anything – she wanted the fan to be turned off. The sisters then ushered Sr Milada towards Mother Teresa, boldly introducing her as the sister from Australia who had never met Mother. “And Mother looked at me and she had this cheeky smile on her face, and she said, ‘Mmm, now you have to obey Mother properly’,” Sr Milada laughed. 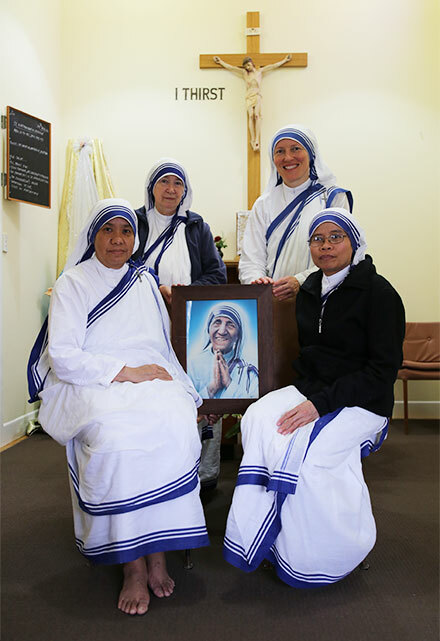 After receiving a blessing from Mother Teresa, the four sisters returned to their work at the formation house, but told Sr Milada to stay at the Mother House and spend the morning with Mother Teresa. She helped unpack personal items from a cardboard box, which Mother Teresa used instead of a suitcase. At one stage, Mother Teresa bent down to put on a pair of sandals, expressing her urge to go out and be with the poor. “So I jumped in and I was trying to put her sandals and I put the buckles on for her,” Sr Milada said. “Mother was so short and she was bent as well, so when I finished putting on her sandals I was kneeling in front of her. “So she held me, she held my face with her two big hands and she looked straight into my eyes and she was, you know, looking at me very intently. “She said, ‘Sister, you have come here for your final vows. You have this one full year to prepare yourself. Don’t waste even one minute. It’s a precious time. It’s a precious time for you’. The pair continued to talk about Sr Milad’s family in Australia and whether she had written to them lately. Suddenly the tiny Albanian sister opened one of her drawers, searching for a gift. “Unfortunately as usual in Mother’s room there’s nothing in her drawer,” Sr Milada said. “I actually had two pictures of Mother holding a baby in my bag … so I asked mother could I have those pictures signed. “She said, ‘Sister, bring them’. “With all her heart she wrote ‘God bless you, Mother’ on top of the pictures. “Because if Mother ever met any sister’s parents she would talk to them, she would give them time, she would say thank you so much for making that sacrifice of giving your daughter to us and to me, thank you very much and God bless you. “She couldn’t do that to my parents but she signed this picture and told me it was from her. While in Kolkata, Sr Milada joined other temporarily professed sisters for weekly instructions with Mother Teresa, who would share stories as well as offer advice on how to love Christ. One of those stories happened when Mother Teresa was younger and, after falling ill, remembered meeting St Peter at the gates of Heaven. St Peter told Mother Teresa she could not enter the gates because “there were no slums in Heaven”. “She said to St Peter in her heart, ‘You wait, I will fill up heaven with poor people’,” Sr Milada recalled. She thanks God every day for giving her a chance to meet the now canonised saint, because just three months after her arrival in Kolkata, Mother Teresa died. Watching the reactions of people in Kolkata, Sr Milada said Mother Teresa’s earthly life had obviously broken the stark division between the rich and poor in India. “In the stadium where they were having the funeral service … the VIPs were sitting in front but right next to them were the poor people,” Sr Milada said. She believed Kolkata’s rich and poor would unite again for her canonisation. When news of her canonisation on September 4 was made official, Sr Milada said it was just confirming what the sisters had known all along. “On one hand people had been calling her the living saint when she was still alive, so we all know, everyone knows that Mother is a saint,” she said.